The leading vendors in the global building information modelling (BIM) extraction software market are at the forefront of advancement in the constructions industry. These vendors have consolidated their market standing by providing some of the most prudent software analogues to the industry. The medium-scale vendors in the global building information modelling (BIM) extraction software market have to deal with cutthroat competition prevailing in the market. These vendors are projected to form collective alliances in order to avert the raging competition from leading vendors. Some of the key players in the global building information modelling (BIM) extraction software market are FARO Technologies, Inc., Safe Software, Inc., Tekla Corporation,Vectorworks, Inc., Synchro Software, Microsoft Corporation, and Nemetschek Group. 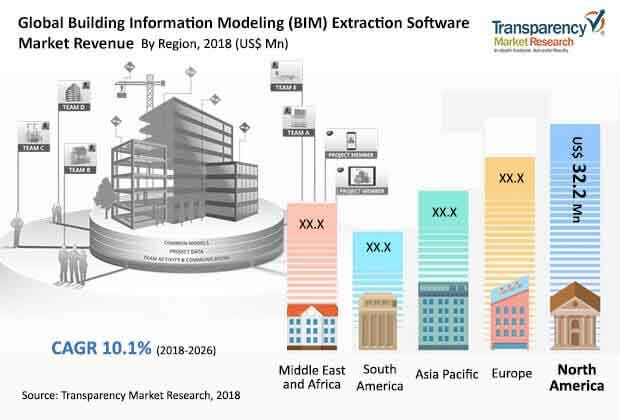 Transparency Market Research (TMR) predicts that the global market for building information modelling (BIM) extraction software would expand at a starry CAGR of 10.1% over the period between 2018 and 2026. Furthermore, the global building information modelling (BIM) extraction software market is expected to accumulate revenues worth US$ 228.7 Mn by 2026. On the basis of end-use industry, the implementation of BMI in the construction of factories and warehouses has gathered speed. Based on geography, the market for building information modelling (BIM) extraction software in North America is expanding at a stellar pace. The demand within the global building information modelling (BIM) extraction software market has been rising alongside growing pace of urbanisation. The use of BMI for the construction of better roadways and railways has also played a crucial role in market. The presence of a separate domain for architectural planning has also reeked of growth within the global building information modelling (BIM) extraction software market. Several new projects for construction of dams and highways are in the pipeline, and this is also a key prospect for market growth. The constructions industry involves the interplay of multiple services and forces. In recent times, the working standards and procedures within the constructions industry have undergone fundamental changes. A number of construction entities necessitate the creation of blueprints and 3D archetypes for houses, buildings, and other structures. This factor has directly influenced the demand within the global building information modelling (BIM) extraction software market in recent times. Moreover, the need for better utilization of space has also necessitated the deployment of BMI software. The review is based on TMR’s report titled, “Building Information Modeling (BIM) Extraction Software Market (Software Deployment - On Premise Software, Cloud-based Software; End Use Industry - Water and Wastewater, Rail Transit and Aviation, Energy Generation Facilities, Roads, Bridges, Highways, Houses and Apartments, Factories and Warehouses, Educational Institutes and Commercial Spaces, Government Buildings, Dams and Others) -Global Industry Analysis, Size, Share, Growth, Trends, and Forecast 2018 – 2026”.